Marilleva similar as her twin sister Folgarida is a purpose-built ski resort offering great and convenient services for memorable ski holidays. The resort can host 10 000 people and has modern tourism facilities to enjoy your stay here the fullest. 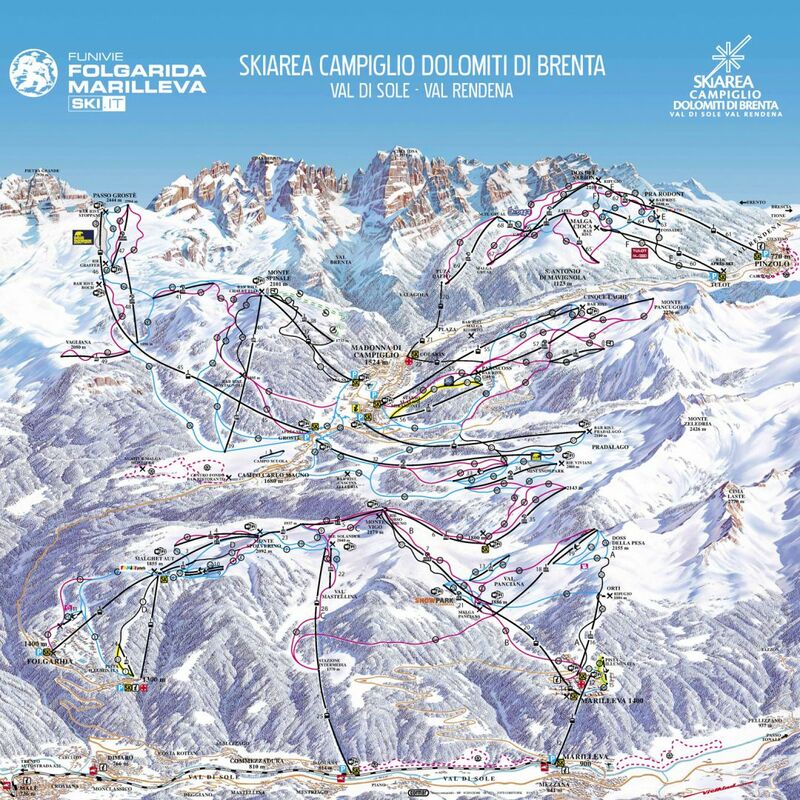 Here you’ll find vital information on the Marilleva ski resort as well as help and guidance in booking your transfer. Marilleva ski area is a part of the great Folgarida/Marilleva ski area. It is located on the sunny side of Alps and is a great ski destination for all your family. Marilleva previously linked to forestry and pasture, last century was developed into ski resort. Similar to Folgarida, Marilleva offers modern ski lift with high capacity and other facilities for comfortable stay here. We take a dynamic approach developing our prices for transfers. This means we won’t just offer you a flat rate quote to and from Marilleva, we’ll take several condition into consideration before offering you a price. Despite being cheaper than our competitors – we still offer you the best possible deal! Marilleva sits at 900 m with pistes/trails from 1400 m to 2179 m above sea level. Marilleva is a great destination for intermediate and beginner skiers as well as those with families. Marilleva is a perfect winter ski trip for all the family. Here are many highlights for families with kids. Not only children of age up to 8 years get a free ski pass - same as their accompanying adult. There are also several great activities for children of all age. Marilleva offers several snow parks for children learning to ski in professional ski schools, fun outdoor activities for all the family and lot more. If you are looking for lowest cost airport transfer provider in Alps, you have come to the right place. We offer the cheapest airport transfer in Alps for all your needs. You may wonder, how is it possible? Our vehicles are based at our departure airports that is way we can provide the lowest cost, reliable and most punctual transfer services in Alps. Book your transfer online with us to guarantee the fastest, most efficient and lowest cost journey to your destination. If you require a transfer service to/from destination or airport which is not listed, get in touch with us directly and we will do our best to help you. We operate at the lowest cost possible without compromising on service, reliability and safety. Start and end your trip to Marilleva in the best possible way. Book your transfer here.